Diwali came and went with a bang. My guests set off fireworks, smashed every single wine glass to smithereens and left pools of candle wax everywhere. They also left behind a considerable amount of food. After all, I plan party food quantities like every good Indian girl. I count how many people are coming. Double the number, add 10, then another 10. Just in case. No wonder I eat leftover party food for days after. Aloo kadhi it was for one whole week. 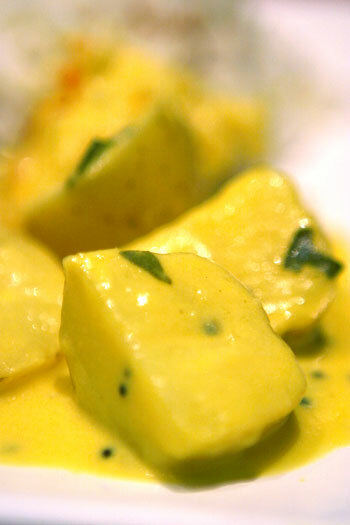 Cubes of new potatoes cooked in a light, spicy yogurt and gram flour curry. A staple back home on Diwali. At first I enjoyed its light texture, depth of subtle masalas, etc etc etc. Then I ate it for lunch and dinner. With rice. Roti. Even salad. For three days. By the fourth, I was recoiling at the horror of the bottomless buttercup yellow curry. By God, these were persistent potatoes. Interestingly, they tasted better as we went along. As I grazed the bottom of the Tupperware container, the yogurt had just the right blend of sweet and sour that I remembered back home. Bring the potatoes to boil in a large pan of cold water. When you can insert a fork through them with a little bit of effort, drain and set aside. In a large bowl, mix the yogurt, water and gram flour together. You want to whisk it well so that there are no little lumps in the gram flour. I find the quickest way to do this is to whisk the mixture for a minute and then run it through a sieve, into the pan containing the potatoes. Bring the oil to heat in a small frying pan over a high flame. When it is hot add the asafoetida. As it sizzles up add the whole chilli, then mustard seeds, fennel seeds and finally the curry leaves, chilli powder, turmeric powder and sugar. Take the pan off the flame in two minutes and mix it into the potato and yogurt mixture. When you are ready to eat, place the potato curry pan over a medium heat and stir slowly until the yogurt is heated through and you can’t taste the raw gram flour. This takes about 10 minutes. If the yogurt starts splitting, take the pan off the flame and lower the heat slightly. Finish by adding salt to taste and enjoy for days. I add Spinach, gives it great texture and color. Looks good there , gloden delicious! Enjoy. hahah!! I know just what you mean about the leftover party food – my leftover Diwali dinner is all packed and sitting in the freezer for when I’m in no mood to cook! I absolutely LOVE Kadhi, and if it’s been lying around for more than a day, then I just can’t help myself. It always tastes better the next day!! This looks great! Can you make everything beforehand and refrigerate until you’re ready to do the final heating step? Looks lovely. 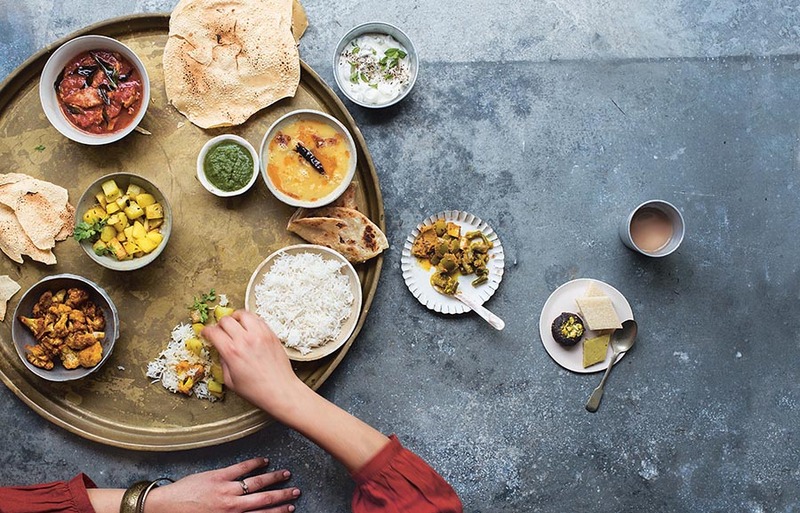 I need to try potatoes, gram flour and yogurt combination! what??? u had too much of leftover??? why didn’t u ring me then? Mallika that picture is simple amazing!!! I know leftovers can be relished for a day or two after that its such a pain!! love reading your post!!! The pic is so beautiful! Never tried a kadhi with aloo before. Thanks all. Erin – of course you can. Just reheat on a very slow flame or the yogurt will split and it’ll all be one big mess!! Instructions mention adding sugar to the oil, but there’s no mention of sugar in the ingredients. How much sugar and what sort (white/brown/jaggery) would you recommend? Half a teaspoon of plain white sugar will do just fine. Sorry about this. I blame my small brain!! Hellooo Mallika! What a God-send ur site is! Just discovered it yday!!!!!! Im a big fan and Im gonna try this for dinner with rotis tonight! Ur recipes are so so simple and so Indian.. everything looks yum.. Tx!